Morning after breakfast transfer to Delhi Airport to board one of the most spectacular Trans - Himalayan flight to Leh. Meet on arrival at the Leh Airport (3500 mts) transfer to the hotel. Rest of the day for rest and leisure to acclimatize. Evening Visit to Leh Market & Shanti Stupa. Overnight stay at hotel. Morning after breakfast drive to Alchi. Upon arrival check into the Hotel. In the afternoon after lunch proceed to visit the Alchi Village. 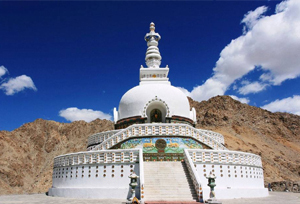 The village is famous for the existence of one of the oldest monasteries in Ladakh Alchi Monastery, mainly known for its magnificent, and well-preserved 11th or 12th century wall paintings, all in an Indo-Himalayan style. Alchi is a small village with several tourist homestays, most offering modern conveniences for overnight stays, the best time to visit is from June to September. After breakfast proceed for sightseeing at Alchi. Visit Alchi Choskor Gompa. Post Lunch at hotel proceed for Saspol Village and its village. Also visit Nyidaphuk Gompa. Overnight stay at hotel. Morning after breakfast, we will take you to the Skurbuchan village and later on proceed to Dha Village to see the beauty of the Apricot Flowers. Later proceed to Kargil along Sanjak valley. Upon arrival at Kargil check in at hotel. Overnight stay at hotel. 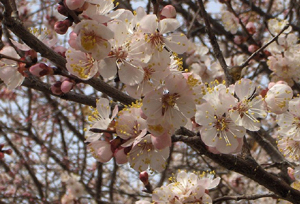 Full day enjoy the beauty of the Apricot Flowers near Kargil. Overnight stay at hotel. Morning after breakfast drive to Alchi. En-route visit Mulbek Chamba Lhakhang. After that drive to Lamayuru via Namika - la, Fotu - la and sightseeing of Monastery of Lamayuru. Later on continue to Alchi. On arrival at Alchi check in at Hotel. Overnight stay at hotel. Morning after breakfast drive back to Leh. Upon arrival at Leh check into the hotel. Evening free for leisure or your own activity. Overnight stay at hotel.